Spring Session begins April 1, 2019. Click here to register online. If you have questions, please call Artsplace at 203-272-2787. Artsplace 2019 full color calendars are available for $15 each in a limited supply at Artsplace and Barbara’s Gallery. The beautiful color calendars feature original artwork by 13 local, award-winning artists who either teach or are on staff at Artsplace. 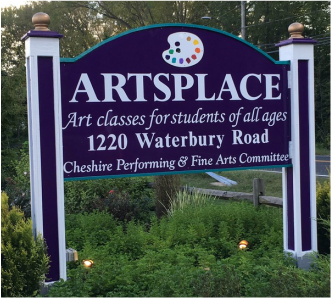 Published by Friends of CPFA/Artsplace, Inc., a non-profit organization supporting Artsplace with a focus to nurture the arts and provide a richer culture to Cheshire residents. Calendar proceeds will help sponsor art events and programs like the Art Heals Program and the Kensett Book Project. Call Artsplace to reserve a copy or learn of more locations. Art classes, camps and workshops for all ages and abilities. ﻿﻿﻿Need to know more? New to the area or Artsplace? Have specific questions on classes or programs? ﻿﻿So much is happening here at Artsplace we'd love to share it with you. Upcoming workshops, special events, class progress photos, tips and techniques from our instructors, it's no secret that when it comes to creating art we're all about sharing- so sign up for our schedule of programs to put a little color and bright ideas in your inbox today!